Sleeping two people, this recently renovated apartment is located in the sophisticated district of Sarrià-Sant Gervasi, a tranquil and residential neighbourhood with good transport links. Just a five minute walk from the nearest train station, this apartment is ideally located for longer stays in the Catalan capital. A large double bedroom has plenty of natural light from large windows that take up the majority of one wall. The room has a modern ensuite bathroom with a glass walk-in shower and also includes a large chest of drawers unit as well as en extensive built-in wardrobe, a television and homely furnishings and décor. The open-plan living, dining and kitchen area has a welcoming feel, with a colourful décor and comfortable furnishings. The kitchen is fitted with all the essential appliances including an oven, hob cooker, dishwasher, microwave, pots and pans, coffee maker and toaster. Enjoy your home-cooked meals at the dining table with friends or family. A private balcony means you can enjoy an evening drink al fresco or soak up the Mediterranean sun. 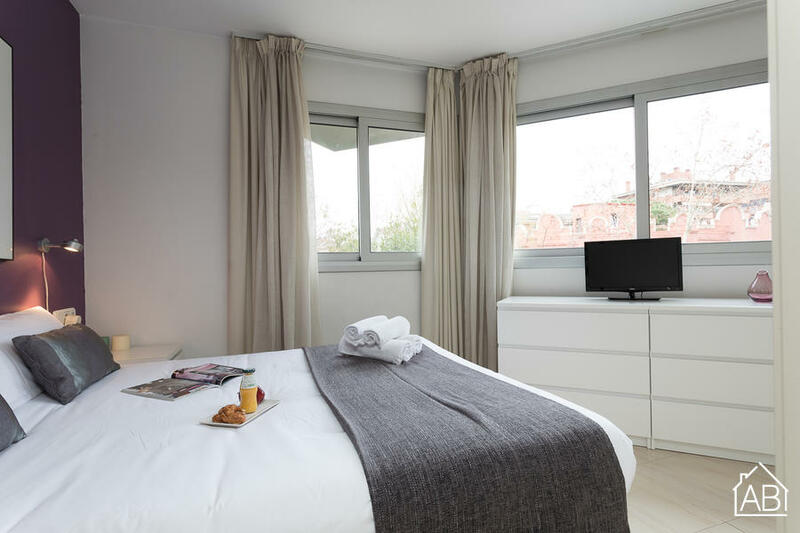 WiFi, an iron, air conditioning, heaters and a washing machine make this apartment an ideal choice for your stay in Barcelona.